When I was writing for About.com, I started a photo gallery of peaks. 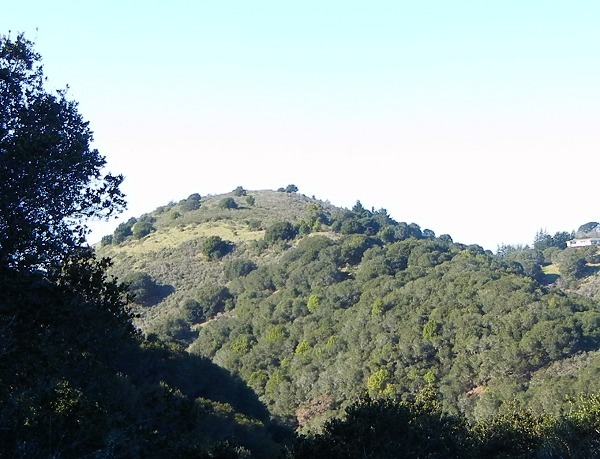 My philosophy was that there are lots of mountains besides the famous ones, like Mount Diablo, that are local heroes. Even a minor eminence can be the center of a neighborhood, and a hillock the heart of one kid’s fantasy world. I also entertained the idea that every hill and mountain is capable of being photographed in its heroic moment, so to speak — posed at a particular angle, in the right setting of weather and time of day. Which brings me to 1175 Hill. You’ve surely seen it on the eastern skyline as you look past the Oakland LDS temple. I don’t know its local name, so I call it by its elevation, as shown on the local topo map. It’s part of our landscape. Let’s circle around it, going clockwise. The photos were taken at various times during the last three years. 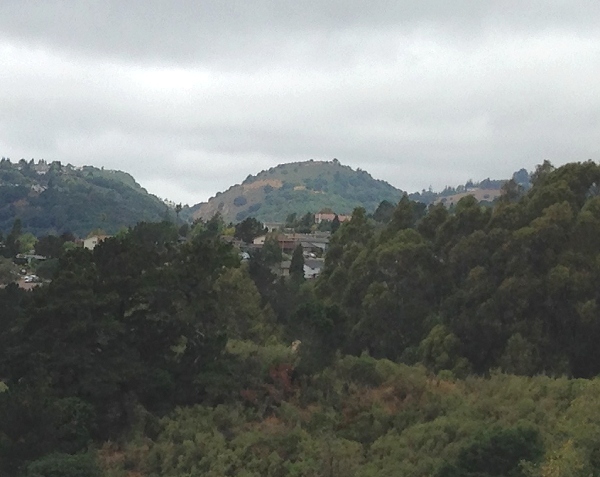 This view is from McKillop Drive across Sausal Creek. 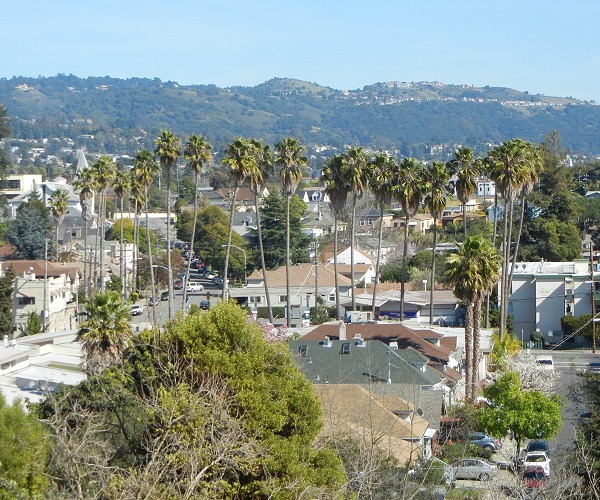 The palms are on Fruitvale at School Street. Here it is in a view along Macarthur Boulevard in the Dimond district. 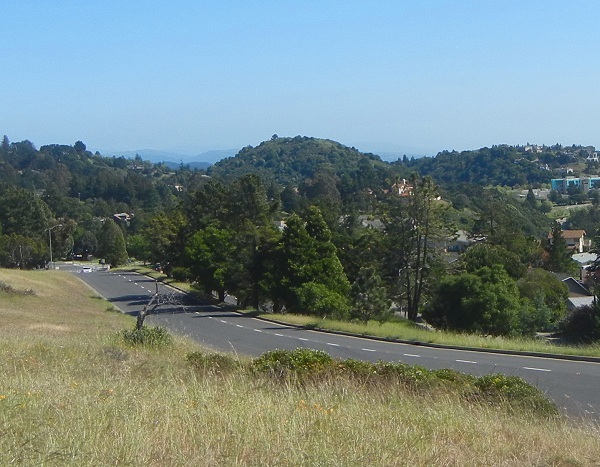 This view is from Skyline Boulevard at Serpentine Prairie. 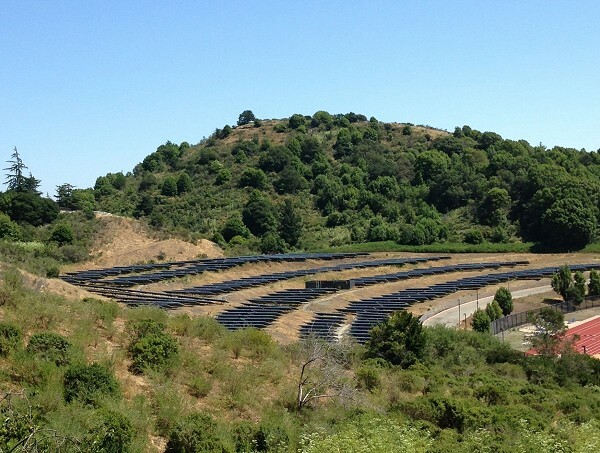 This is from Bacon Road, looking across the big solar array in back of Merritt College. Here it is from Skyline down around Lexford Place. We’ve gone halfway around the hill. From the Artemisia Trail, down in Leona Canyon, the hill appears at its most imposing. We can look straight up the hill’s axis from the top of Elysian Fields Drive. 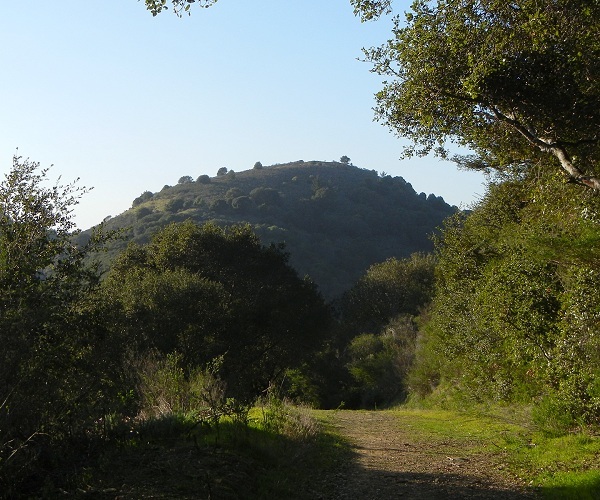 From the west side of Leona Canyon, on the Pyrite Trail, is the last good glimpse of 1175 Hill. Houses along the ridgeline on Campus Drive get in the way, keeping the best views in their back yards. And we close the circle at Merritt College. This is how the hill looks right next to the bus stop, a real ornament to the campus. The hill has a city survey marker on its top, which is presumably where the elevation was measured. On topo maps before the 1959 version, its elevation is shown as 1168 feet, without a symbol. This signifies that its elevation was probably determined from stereo aerial photos. The 1897 and 1915 maps show it as no higher than 1120 feet. So I can say that as civilization approached and surrounded it, this hill has grown in our estimation. I hope with this post to further raise its esteem. 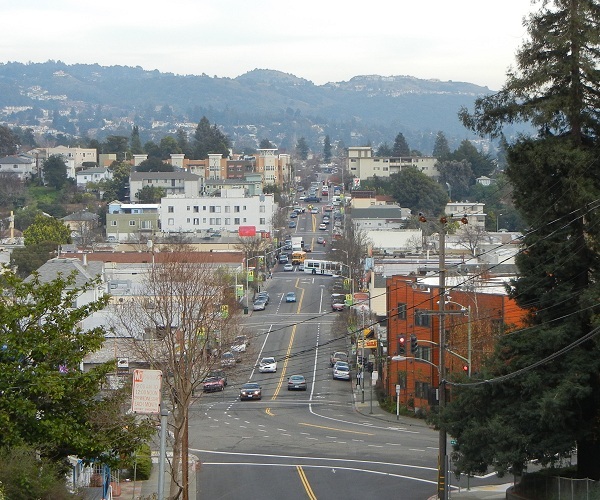 This entry was posted on 17 August 2015 at 8:02 am and is filed under Oakland peaks. You can follow any responses to this entry through the RSS 2.0 feed. You can skip to the end and leave a response. Pinging is currently not allowed. Very good write-up. I’ll have to check some of these scenes out myself one day. My favorite photo is that last one. 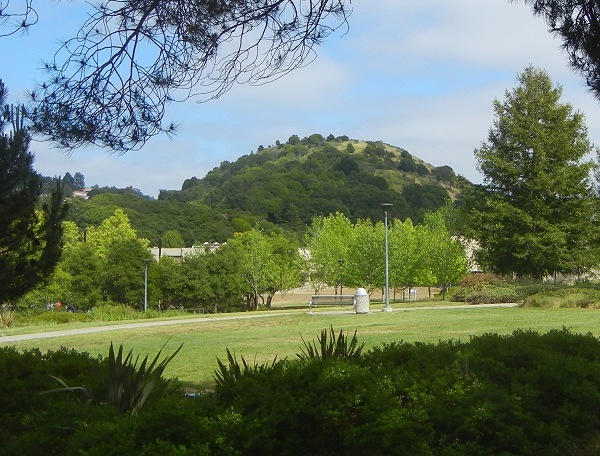 My guess is the miners who took rhyolyte out of what is now Merritt College would have named the hill. The soccer fields at Merritt College, also called the Devil’s punchbowl, have the worst drainage well because…ryolyte ain’t that porus. If I have a chance to drop by the Oakland History Room at the main library, then perhaps the hill’s name is recorded in a non-digital source. I recall that Ridgemont Development Corp’s original proposal in the mid-1970s included grading the top off this hill and filling the upper end of Leona Canyon to make more home sites. 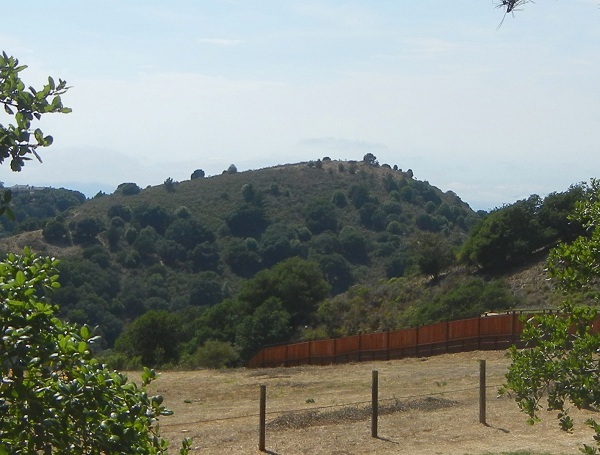 Citizen outcry resulted in dedication of this hill and the canyon below as open space. Pretty sure this is another view of the hill in question. Pic isn’t great, (cell phone through an airplane window) but you can (barely) pick out the Mormon Temple smack dab in the middle of the image, above the plane tails. Feel free to download and post the pic if you’d like.